More and more people are now deeply concerned about environment, let’s hand in hand with WA PRINTING do something meaningful to community with tradie cardboard notebook and pen. 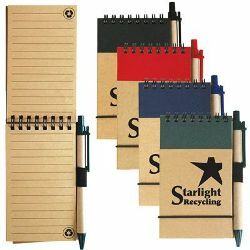 Made from unbleached cardboard cover with 60 sheets of spiral bound lined papers with perforations that can be recycled. You also have plastic pen loop with recyclable paper pens. Make them more impressive with brand logos and messages imprinted by WA PRINTING, you will see how they are beneficial to your business! ITEM SIZE(MM) 77L x 130H. PRINT AREA(MM) Pad Print Notebook - 50L x 50H, Pad Print Pen - 50L x 6H., Standard Label - 50L x 50H. LABEL SIZE (MM) 50L x 50H. COLOURS Natural/Black, Natural/Blue, Natural/Green, Natural/Red.